One of the fastest growing segments of our business is customers adding granite or other natural countertops to bathrooms. It seems that more and more people are asking us to help them with the bathroom renovations because they feel that a beautiful bathroom is an important part of the décor of the house. Lately, not only are people focusing more on the bathroom, they are also getting quite creative. 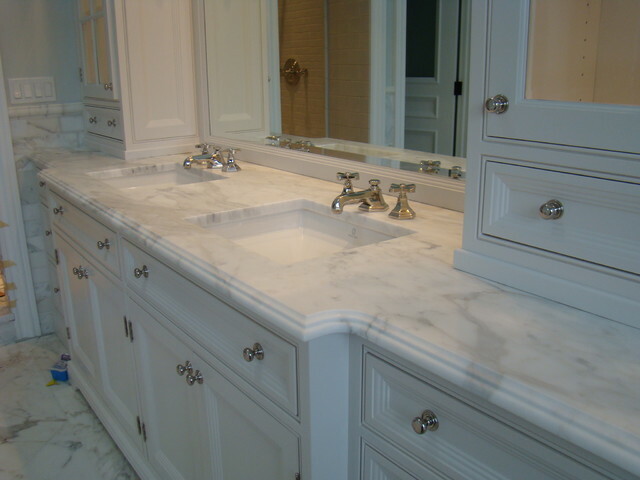 Whether it is counters or vanity tops Atlanta wants granite and natural stone! Marble bathroom countertops are also increasing in demand. It is important for them to make sure that the bathrooms stay within the flow of the décor of the house. For example, if the house has an earthy feel, the bathrooms are sure to reflect the décor with a complementary earth tone that adds depth and subtle contrast. Granite Countertop Warehouse and Crowe Custom Counters have the inventory, experience and expertise needed to turn your bathrooms into a work of art. Whether the bathroom is large or small, our designers can help you crystallize your vision and ensure that your bathroom counters meet your expectations. From granite in Alpharetta, GA to granite countertops Dallas, GA, our knowledgeable design experts take great care in getting to understand the details and nuance of your décor. It is important to take all the different elements in the bathroom into the consideration including faucets, sinks, wallpaper, cabinetry, paint, bathtub, shower, lighting and flooring. Our designers understand that all these elements must work in harmony in order to achieve a successful look.